The main goal of the lab is to understand how plants take up, accumulate and transport trace metals between roots and leaves and from leaves to seeds. Plants and seeds are the main dietary source of essential nutrient metals such as zinc (Zn), iron (Fe), manganese (Mn) and copper (Cu). However, plant-based products are also the main entry point for toxic elements like cadmium (Cd), arsenic (As), mercury (Hg) and lead (Pb). Some of the detrimental effects of heavy metals on human health have been linked to diabetes, hypertension, myocardial infarction, diminished lung function and certain types of cancer. Long-distance transport of heavy metals. Plant transcriptional responses to environmental stresses. 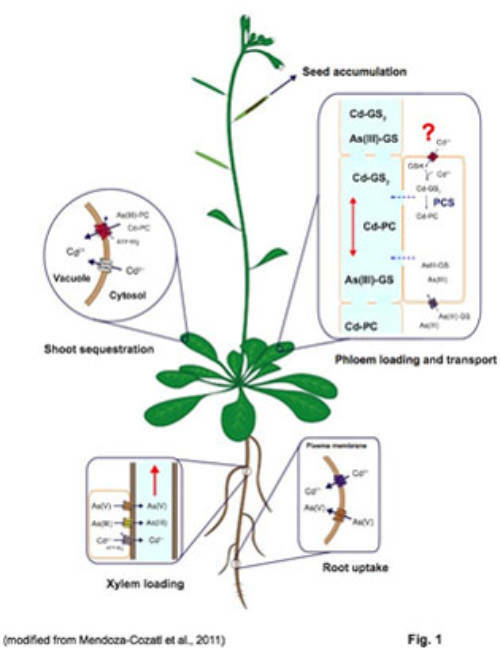 Distribution of heavy metals between roots and shoots is a dynamic process orchestrated by several plasma membrane transporters, metal-chelating molecules, xylem-loading/unloading and phloem-loading/unloading processes (Fig. 1). Root-to-shoot transport of metals occurs mainly through the xylem; however, due to the limited transpiration rate within reproductive tissues, xylem plays only a minor role in allocating nutrients into the seeds (Mendoza-Cozatl et al., 2011). Phloem transport, on the other hand, plays a key role in delivering nutrients, including metals, to developing seeds. The Mendoza lab is currently focusing on the isolation, identification and characterization of phloem-specific transporters of trace metals, essential and toxic, using the reference plant Arabidopsis thaliana. Glutathione (GSH) and phytochelatin biosynthesis (Fig. 2) is perhaps the most studied mechanism for heavy metal detoxification and accumulation in plants. GSH has several functions in the cell, including the control of cellular redox, detoxification of xenobiotics, sulfur storage, synthesis of glucosinolates and synthesis of metal-chelating peptides called phytochelatins (PCs) (Mendoza-Cozatl et al., 2010, 2011). The enzymes that synthesize GSH have been identified and their kinetic properties well established. The transcriptional regulation of GSH biosynthetic genes, however, is largely unknown. The lab is using a systems biology approach to identify transcriptional regulators of GSH biosynthesis in an effort to understand how plants sense and respond to different environmental stresses. The Mendoza lab is also exploring ways to increase the capacity of plants to accumulate toxic compounds for bioremediation purposes. Metabolic engineering requires a deep understanding of the genetic and regulatory processes that govern the structure of metabolic pathways. Traditionally, regulation of metabolic pathways is attributed to rate-limiting steps. However, the “rate-limiting” concept can be misleading since it assumes that only one enzyme controls both, the rate of synthesis of a given metabolite as well as its concentration. The goal is to move away from the rate-limiting step concept and understand metabolic pathways as a whole (Mendoza-Cozatl and Moreno-Sanchez, 2006). Using kinetic modeling, overexpression and tissue-specific expression of enzymes and transporters we aim to manipulate the capacity of plants to tolerate and accumulate compounds in specific tissues such as roots, shoots or seeds (Fig. 3). Lee Y, Martinoia E, Park J, Mendoza-Cozatl D, Schroeder (2013) Composition for phytochelatin transport US 2013 / 0212738 A1 (appl. No. 13/881,671 granted on Aug 2013). Mendoza-Cozatl DG, Xie Q, Akmakjian GZ, Jobe TO, Patel A, Stacey MG, Song L, Demoin DW, Jurisson SS, Stacey G, Schroeder JI (2014) OPT3 is a component of the iron-signaling network between leaves and roots and misregulation of OPT3 leads to an over-accumulation of cadmium in seeds. Khan MA, Castro-Guerrero N, Mendoza-Cozatl DG. (2014) Moving toward a precise nutrition: preferential loading of seeds with essential nutrients over non-essential toxic elements. Front Plant Sci. 5:51. García-García JD, Girard L, Hernández G, Saavedra E, Pardo JP, Rodríguez-Zavala JS, Encalada R, Reyes-Prieto A, Mendoza-Cózatl DG, Moreno-Sánchez R. (2014) Zn-bis-glutathionate is the best co-substrate of the monomeric phytochelatin synthase from the photosynthetic heavy metal-hyperaccumulator Euglena gracilis. Metallomics. 6:604-16. Song WY, Mendoza-Cózatl DG, Lee Y, Schroeder JI, Ahn SN, Lee HS, Wicker T, Martinoia E. (2014) Phytochelatin-metal(loid) transport into vacuoles shows different substrate preferences in barley and Arabidopsis. Plant Cell Environ. 37:1192-201. McDowell SC, Akmakjian G, Sladek C, Mendoza-Cózatl D, Morrissey JB, Saini N, Mittler R, Baxter I, Salt DE, Ward JM, Schroeder JI, Guerinot ML, Harper JF. (2013) Elemental concentrations in the seed of mutants and natural variants of Arabidopsis thaliana grown under varying soil conditions. PLoS One. 8(5):e63014. Jobe TO, Sung DY, Akmakjian G, Pham A, Komives EA, Mendoza-Cózatl DG, Schroeder JI. (2012) Feedback inhibition by thiols outranks glutathione depletion: a luciferase-based screen reveals glutathione-deficient gECS and glutathione synthetase mutants impaired in cadmium-induced sulfate assimilation. Plant J. 70:783-795. Mendoza-Cózatl DG, Jobe TO, Hauser F, Schroeder JI. (2011) Long-distance transport, vacuolar sequestration, tolerance, and transcriptional responses induced by cadmium and arsenic. Curr Opin Plant Biol. 14:554-562. Song WY, Park J, Mendoza-Cózatl DG, Suter-Grotemeyer M, Shim D, Hörtensteiner S, Geisler M, Weder B, Rea PA, Rentsch D, Schroeder JI, Lee Y, Martinoia E. (2010) Arsenic tolerance in Arabidopsis is mediated by two ABCC-type phytochelatin transporters. Proc Natl Acad Sci USA. 107:21187-92. Mendoza-Cózatl DG, Zhai Z, Jobe TO, Akmakjian GZ, Song WY, Limbo O, Russell MR, Kozlovskyy VI, Martinoia E, Vatamaniuk OK, Russell P, Schroeder JI. (2010) Tonoplast-localized Abc2 transporter mediates phytochelatin accumulation in vacuoles and confers cadmium tolerance. J Biol Chem. 285:40416-26. Sung DY, Kim TH, Komives EA, Mendoza-Cózatl DG, Schroeder JI. (2009) ARS5 is a component of the 26S proteasome complex, and negatively regulates thiol biosynthesis and arsenic tolerance in Arabidopsis. Plant J. 59:802-13. Mendoza-Cózatl DG, Butko E, Springer F, Torpey JW, Komives EA, Kehr J, Schroeder JI. (2008) Identification of high levels of phytochelatins, glutathione and cadmium in the phloem sap of Brassica napus. A role for thiol-peptides in the long-distance transport of cadmium and the effect of cadmium on iron translocation. Plant J. 54:249-59. Mendoza-Cózatl DG, Rodríguez-Zavala JS, Rodríguez-Enríquez S, Mendoza-Hernandez G, Briones-Gallardo R, Moreno-Sánchez R. (2006) Phytochelatin-cadmium-sulfide high-molecular-mass complexes of Euglena gracilis. FEBS J. 273:5703-13. 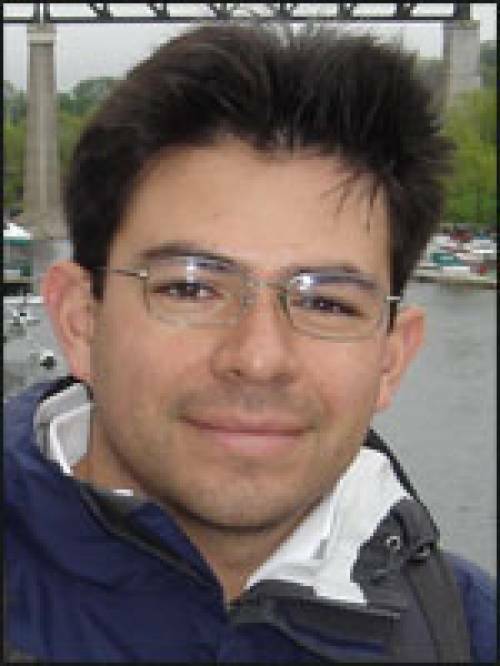 Mendoza-Cózatl DG, Moreno-Sánchez R. (2006) Control of glutathione and phytochelatin synthesis under cadmium stress. Pathway modeling for plants. J Theor Biol. 238:919-36. Mendoza-Cózatl D, Loza-Tavera H, Hernández-Navarro A, Moreno-Sánchez R. (2005) Sulfur assimilation and glutathione metabolism under cadmium stress in yeast, protists and plants. FEMS Microbiol Rev. 29:653-71.